Dashcam Viewer is a robust Mac OS X software solution that is capable to read and play videos captured by Mini 0801 and BlackVue dash cams, and displaying GPS data at the same time. In addition to these camera models, the app also provides preliminary support for GuardTrak cameras. The app includes 4 separate windows for watching the videos, checking graph data, viewing the map (powered by Google) and checking other data. After loading the sequential videos from your camera’s MicroSD, the videos will automatically start playing by date or by name. Thus, using Dashcam Viewer, you can watch dash cam clips in a window and check your vehicle’s data displays (speed, miles traveled, date and time, coordinates and altitude), position on Google Maps, bearing, position, distance and speed graphs in other windows. Furthermore, the player window displays the videos in the exact quality they were captured and provides simple playback controls: the interactive progress bar, volume slider, pause/play button and a slider to jump to a different clip. Also, instead of the skipping through / forward buttons, the app provides buttons to skip/rewind the video with one or ten files. The Dashcam Viewer app also comes with quite a few preferences you can play with. In its settings window, you can make modifications related to the time format, dashcam speed plot, bearing plot, HDOP plot, distance plot, altitude plot and stats in view plot. Moreover, you can change the output units and movie sequencing mode. 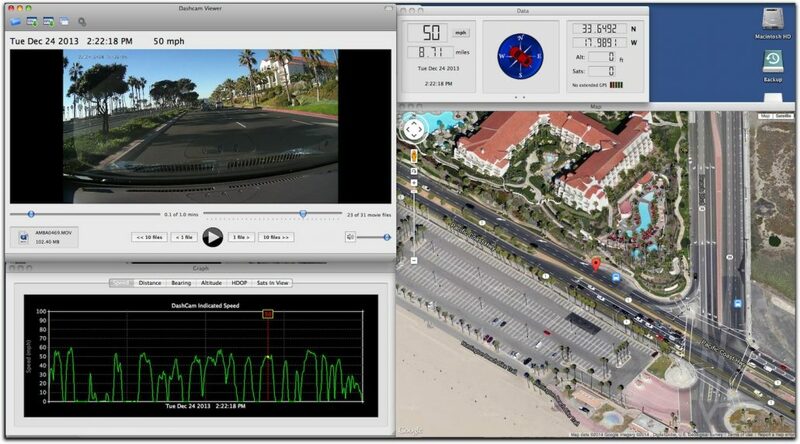 To sum it all up, Dashcam Viewer is quite a powerful OS X application for viewing dash cam movies and GPS data using your Mac. Even though it supports only two cameras and one additional camera (partially), the Dashcam Viewer app displays a ton of extra data and also makes it possible for you to play clips recorded using unsupported dash cams, but without the possibility of checking out the extra data.